Command Performance: The latest LEDs, coupled with sophisticated sensors and wireless technologies, are changing the role of lighting in the built environment. Identify commonly used lighting protocols, discuss their origins and their appropriate applications. Explain how lighting and lighting controls can be designed to enhance building occupants’ circadian rhythms. Describe some of the capabilities and potential uses of so-called “smart” connected lighting systems. Discuss efforts to make the latest generation of lighting-system components interoperable. The ability to control electric light in a user-friendly and visually seamless manner became a viable design option for public, commercial, and residential spaces more than 50 years ago with Joel Spira’s invention of the solid-state electronic dimmer in the early 1960s. Initially developed to enhance homes and other interior environments, architectural lighting controls have since developed into systems that are used to create various scenes for retail and hospitality venues, provide security, and conserve energy usage and costs. Today, largely enabled by the capabilities of advanced, high-quality LEDs and digital tech­­nologies, lighting controls are being trans­-formed into critical networks that not only effectively illuminate the spaces within and around buildings, they enhance the way these environments are used and inhabited. In the half century that followed the introduction of a dimmer small enough to fit into a standard electrical wall box by Spira, the late founder of Lutron, the industry has evolved to keep up with myriad innovations and user preferences. Basic technologies such as 0–10 volt dimming—a protocol as straightforward as its name, developed first for stage lighting, then fluorescent lamps, and now LEDs—have been supplemented with more robust wired protocols such as DALI (Digital Addressable Lighting Interface) and DMX (Digital Multi­plex), both encompassing products from different manufacturers that work together within each distinct convention. According to Arup lighting designer Jake Wayne, DALI is the workhorse that controls most of the typical white architectural lighting in buildings. It’s a standard protocol whereby components such as LED drivers can be controlled individually, allowing for the fine-tuning of a particular fixture or small group of fixtures instead of a vast zone. DMX (a digital-communication network created for theatrical lighting) facilitates dynamic color-changing schemes. DMX is also great for new tunable-white LEDs, which are growing in popularity. 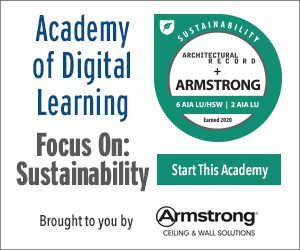 “So we might start to see more commingling of these two protocols in the architectural environment,” says Wayne. 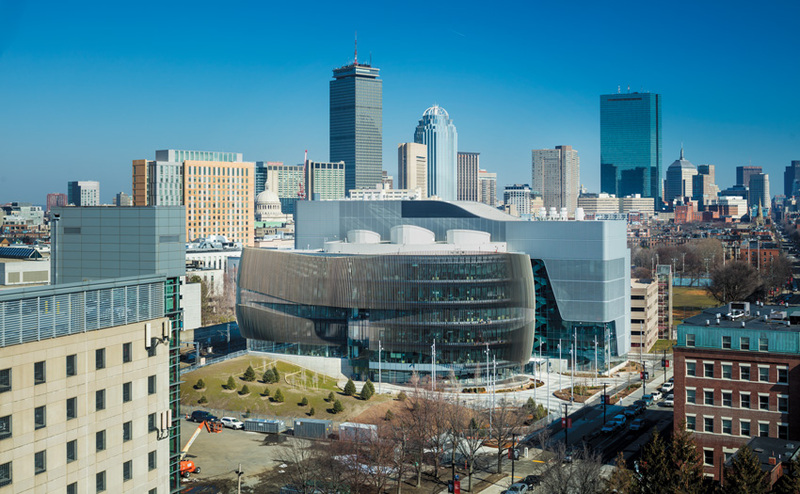 When architects from Payette developed the concept for the Interdisciplinary Science and Engineering Complex (ISEC) at Northeastern University, they conceived its six-story-tall central atrium (see first course image above case study) as the building’s centerpiece, as well as being a student hub for the expanding campus. They envisioned a dramatic and lively space topped by a generous skylight. But as they developed and refined the scheme, the initial mostly glass roof was transformed into one with three discrete cone-shaped apertures. 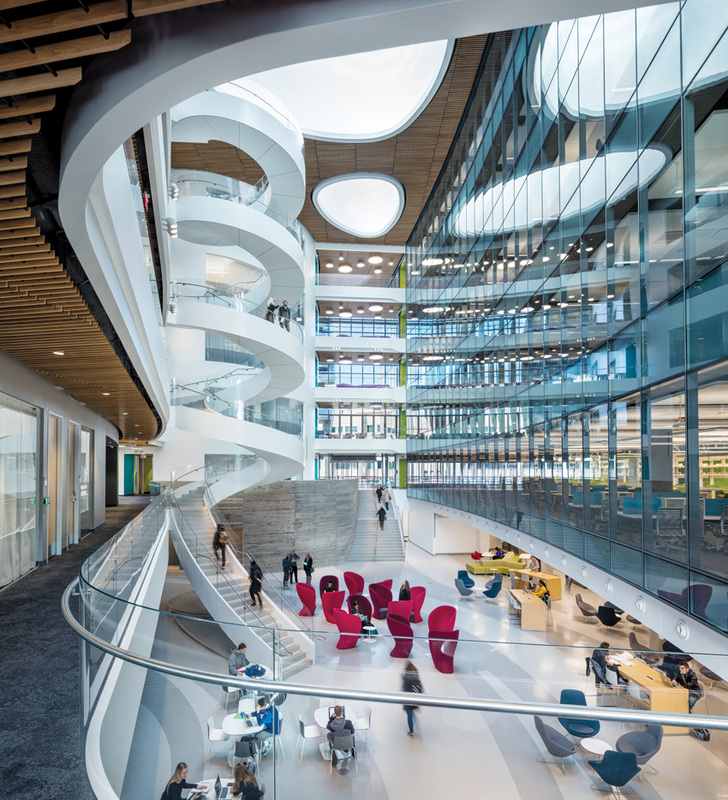 The aim of this “right-sizing” process, according to Arup lighting designer Jake Wayne, was to eliminate glare in the atrium and ensure quality daylight in adjacent spaces—namely laboratory write-up areas (top). These look onto the atrium from multiple levels through a glass wall. For those times when daylight is not sufficient, the write-up spaces are illuminated with Peerless linear pendants that bounce light off the ceiling. The atrium also has supplemental LED lighting, including Selux spotlights tucked into balconies at its perimeter and Lumenpulse RGBW linear projectors concealed in coves at the base of the skylights. The latter fixture provides a soft glow so that the skylights are always legible, says Kevin Sullivan, Payette president. Although the building’s fixtures are wired, its Lutron Quantum control system’s components, such as occupancy sensors, photo sensors, and switches, are for the most part wireless, a characteristic that streamlined their installation, says Wayne. “Typically on jobs, we end up with two or three control typologies just to address all of the requirements of a space,” Wayne explains. This scenario requires a central network system that has the built-in intelligence and programming capabilities to manage them. 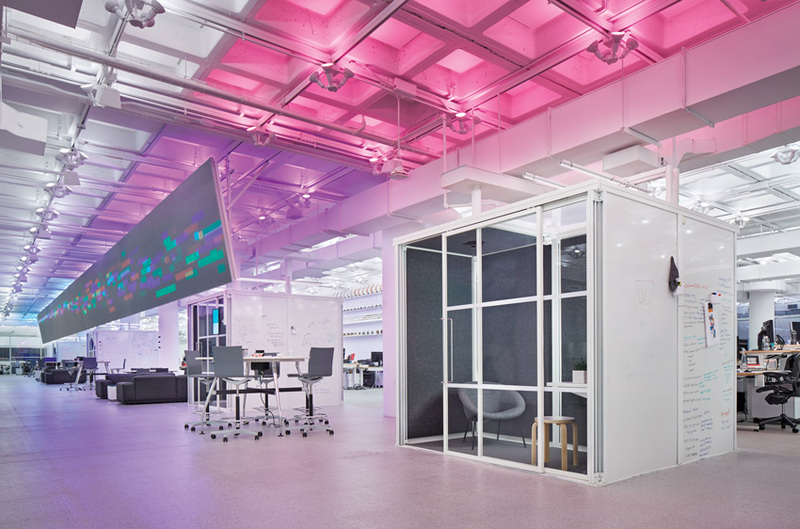 For example, Arup’s recently completed Boston office, where Wayne is based, is a “working lab” installed with several different control typologies. To manage them, the lighting design team is using a central system that controls all the protocols. “Think of it as a server that detects a group of DALI fixtures and knows how to talk to those through the DALI protocol, then recognizes the 0–10 volt fixtures and talks to those through the correct language,” he adds. But once it is implemented and commissioned, all that a facility manager sees is a clean floor-plan graphic through which one can view and modify the scheme. The actual process happens behind the scenes. These open protocols, and the gateway solutions that integrate methodologies without a hitch, are essential for the adoption of new and existing products and technologies, says Joseph Bokelman, chairman of the Controls Protocols Commit­tee for the Illuminating Engineering Society (IES). Many clients are risk-averse, so “the goal is to remove the complexity.” In this regard, connected wireless systems, which eliminate the need for extensive electrical work, are gaining ground with lighting designers and architects for retrofit installations and multi-tenant buildings, as well as for open office and retail applications where the lighting must adapt to variable spatial configurations. Responding to the client’s request for a flexible space, lighting designer Suzan Tillotson and her team devised a dynamic scheme meant to engage the New York employees of the advertising agency R/GA, as well as to foster their creativity and well-being. The design revolves around an indirect lighting strategy using 10,000 RGBW, PAR38 LED lamps bundled into groups of four sockets. Affixed to a unistrut grid below the existing waffle-slab ceiling—painted white for reflectivity—these custom industrial-style fixtures are distributed at regular intervals throughout the two levels of the 134,000-square-foot space (in both open and enclosed areas), then configured to uplight each ceiling coffer. The lamps, by Ketra, have a high color-rendering index (CRI), and wireless connectivity through which they can be programmed to change color, or color temperature in the white spectrum. Taking advantage of these capabilities, the lighting designers created a circadian-rhythm program, which begins at 2700K in the morning, subtly shifts to 4000K at midday, and gradually returns to a warmer color temperature in the evening. Staff can override this system easily with a tablet to incorporate color or alternate scenes for events. A Zigbee-compliant device from Ketra enables the system to communicate wirelessly with a Crestron DMX master control that also ties into the window shades and a/v equipment—simplifying the operation of all three for the office manager. For a new 22-bed behavioral-health unit on two floors of an existing hospital, designers from ZGF wanted to imbue the two central gathering areas—which have no access to daylight—with a natural sense of the passage of time. In order to accomplish this, they developed an illumination scheme based on circadian-rhythm research conducted by the Lighting Research Center at Rensselaer Polytechnic Institute. The lighting subtly changes, with a bright, cool light in the morning that gradually becomes warmer over the course of the day. The aim was not only to provide a comfortable environment, but also physiological benefits for patients who are sometimes admitted for weeks at a time and spend most of their waking hours in these spaces, explains Ed Clark, a ZGF sustainable strategist. 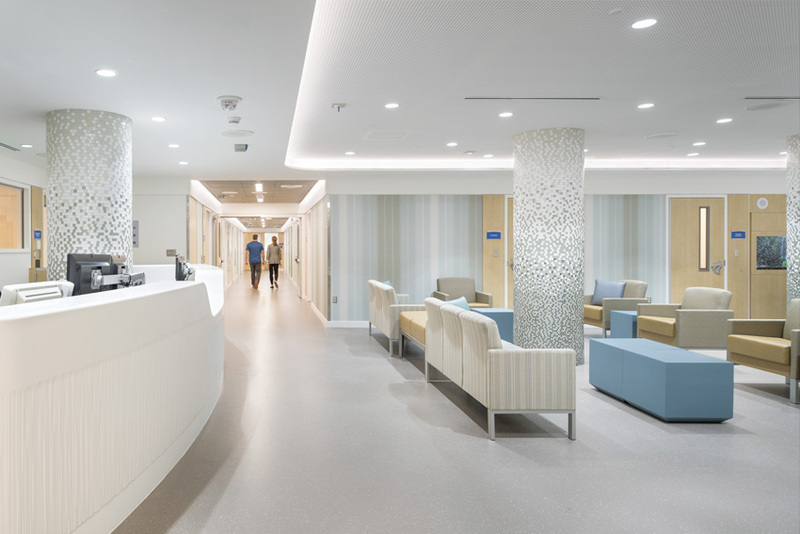 To create an installation that would reinforce patients’ natural wake-sleep cycles, they specified high-CRI tunable-white LED downlights from USAI. And to facilitate the desired modifications in color temperature and intensity, they paired the downlights with a 0–10 volt dimming system. For a cove surrounding the main raised area of the ceiling, they chose double-diode linear LEDs (one orange and the other blue) and a separate DMX control system. When first installed, the fades between colors of the downlights were too abrupt, making the environment “like a disco,” jokes Clark. But after reprogramming, the transitions are now gradual and nearly imperceptible, he says.